This week’s class is focused on climate communication. Yale’s climate change communication program focused on the public’s beliefs, knowledge, and preferences in relation to global warming. They also try to find the underlying causes of the data they collect. 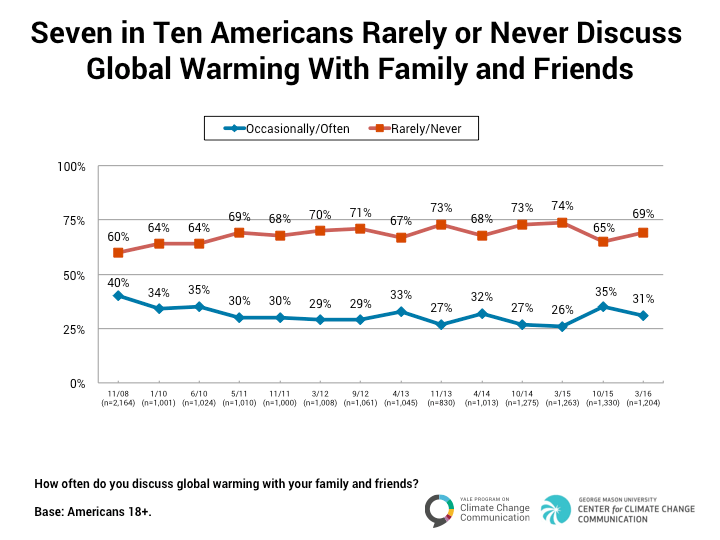 A study done by the group in September showed what they called a “spiral of silence” when American’s communicate about climate change. This term reflects the behaviors of American’s who claim to care about climate change but rarely bring up the topic in larger conversation which then discourages personal discussion on the topic. In another study, the group found that most Americans support the teaching of climate change in schools, along with the causes, consequences, and potential solutions. Yet among adults, climate change is a taboo topic. According to the Yale group, one of the main obstacles in communicating climate change, is knowing the audience. The group has also classified Americans into six groups of audiences to target climate change facts in different ways. 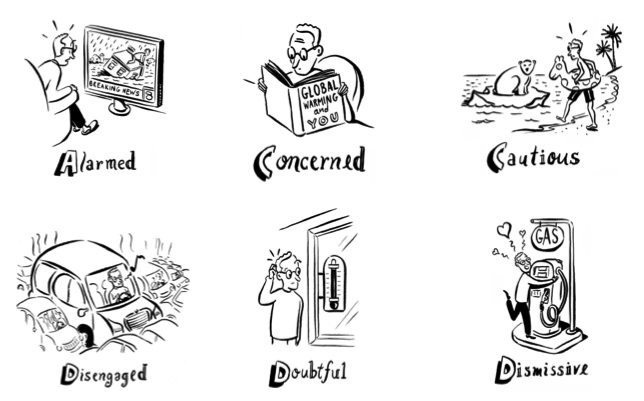 The six audience classifications are: alarme d, concerned, cautious, disengaged, doubtful, and dismissive. The first groups are aware of climate change and usually are taking personal action to mitigate global warming. The middle audience classifications have varying ranges of understanding climate change, and varying doubts about climate change. The last groups are skeptical if climate change is real and participate in activities which are known to add to global warming. Between these groups there is also correlation between religion, perception of public health, and political ideologies of the individuals. Either way, while communication with individuals in these groups certain criteria has been found useful to take into account to aid in spreading the facts. Some of these audience communication criteria are their biased towards the topic, and their willingness to processes the facts. Other criteria are their wanting to counter the facts with existing non-facts about the topic which they believe to be true, and their willingness to communication with continued discussion and acceptance. After learning about the six audience groups it is easy to understand why this “spiral of silence” exists in the mass media and in normal conversation. When you don’t know your audience it can be hard to know how to portray the facts. Sometimes relaying correct information in the wrong format can be just has harmful as the wrong information displayed in the right format. Hopefully the six groups will become more homogeneous and messages can be better distributed from the scientists to the public. It is crazy to me how many people don’t believe that climate change is happening at all. I read some of these articles and it seems like the best way to go about educating the public more on climate change is through the younger generations, and also teaching climate change science in schools. I think once people are more educated and have the right facts, instead of all the false information that is throw around in the media, there will be a better likelihood of change happening.